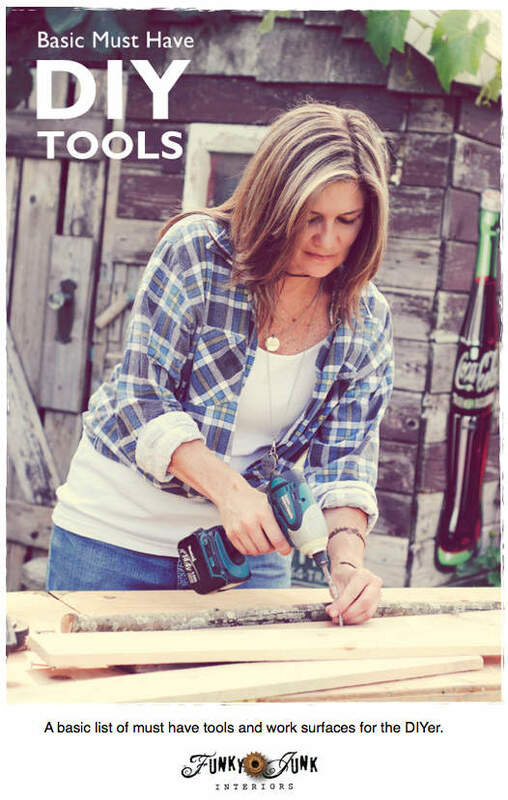 As most of you are already aware, I am a power tool girl. While I certainly do have my favs, I’ve been without a miter saw for quite some time. But thankfully, not any longer! 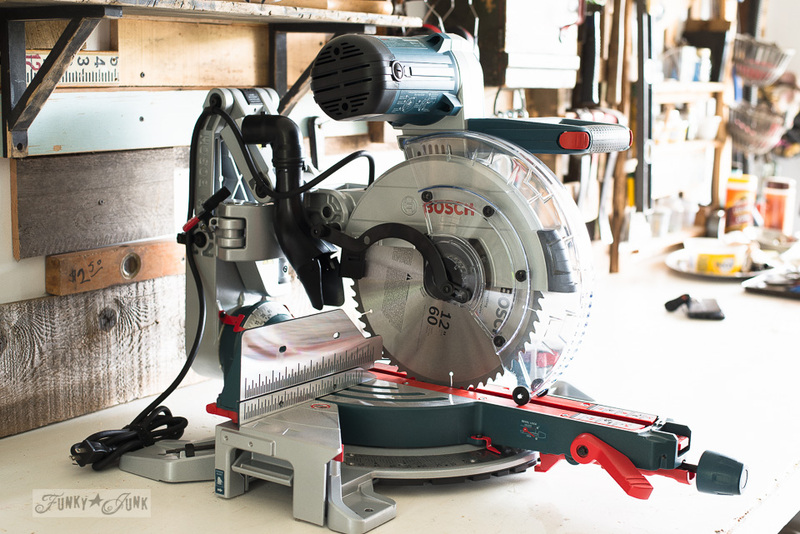 Meet the newest member of my tool family… a Bosch miter saw with some pretty dreamy features! However the biggest perk is the space it saves due to a really cool arm. 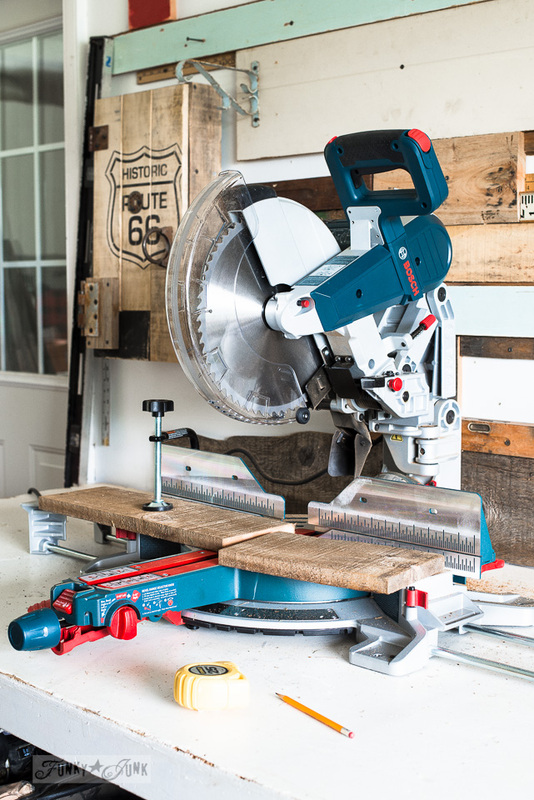 This slick robot-like Bosch miter saw is all kinds of fancy with more features than I will ever use. However more is better than too little, right? And maybe I will! Or at least a refresh. Last winter, my 30+ year old simple chop-styled miter saw (seen above in better days) broke while I was cutting a big chunky irregular branch. The kickback I received not only completely freaked me out, it broke the blade safety guard shield, which in turn shut the machine down. I honestly don’t know if the entire saw broke or if it just needed a new guard. However since this beast was so old and cut with such limitations, I put it on the curb and let it go. Thing is, the break kinda traumatized me. 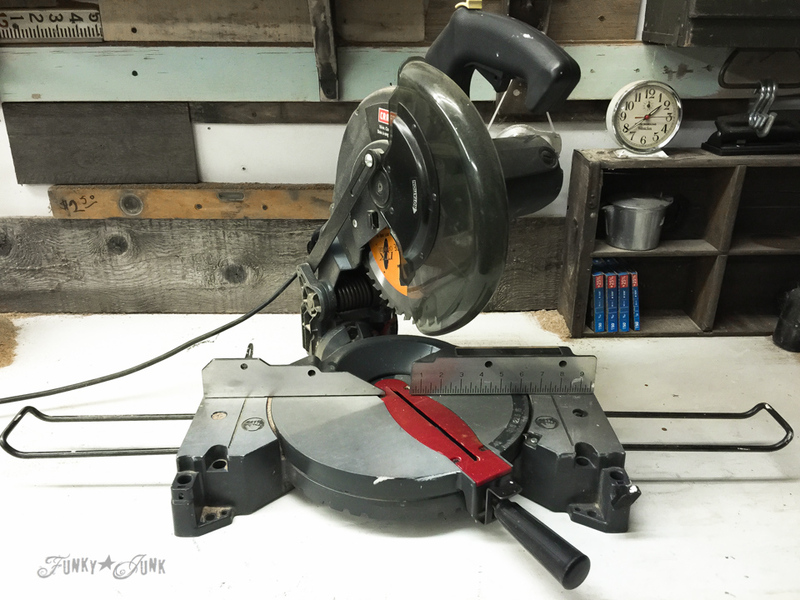 The kickback had been so fierce I didn’t desire to look at another tantrum-inducing miter saw for a good long time! I limped along with my even more limited jigsaw. However, I knew being afraid wasn’t a good long term solution. So I started looking. I waited for a deal. I waited for clarification through reviews I was buying ‘the best’. Newspaper ads were read and online deals confused me weekly with their crazy-train rotating prices. I also visited some big box stores. And got little to no help nor guidance on the sales floor. Store samples were chained up at a height that was too high to play with, with some models still boxed. How in the WORLD could I shop like that?! Until a deadline approached. I was to lead a sign workshop that required me cutting enough wood to warrant revisiting this issue once again. I needed a saw. NOW. Gulp. It was only then I remembered a recommendation made by my brother long ago. I’ve written about them before when I bought my Bosch palm sander HERE. So the next time I went into that town, I made the stop. No, there are not sales. No, this is not a sponsored post. However I recieved more one-on-one advice than I’ll ever utilize, and all the saws were displayed at table height so you would play with each one. A place like this is worth their weight in GOLD. Especially if you aren’t sure what you need and require sound advice. In 15 minutes I had my new toy loaded in the back of my truck. Put together, and unwrapped. Yes, all that too. And here is my new toy I brought home. Isn’t it pretty?! 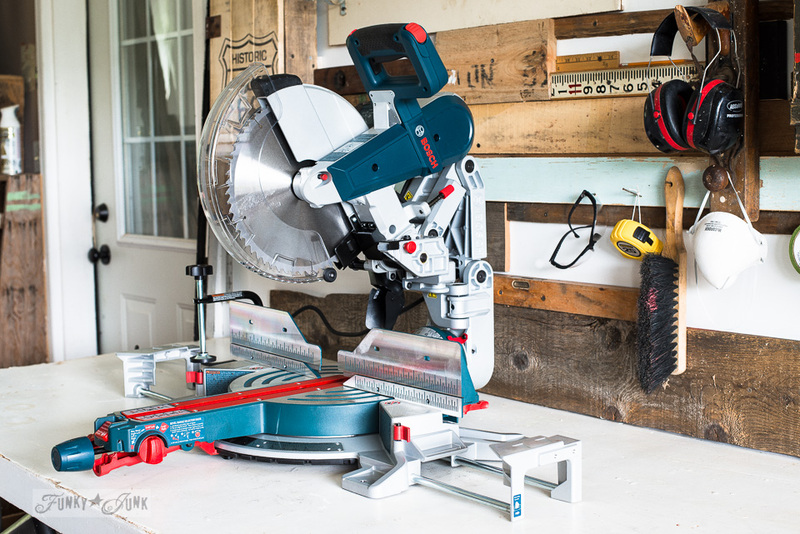 This Bosch miter saw was selected for the slider arm extension AND the fact that there are no sliding bars behind the saw that take up a bunch of room. 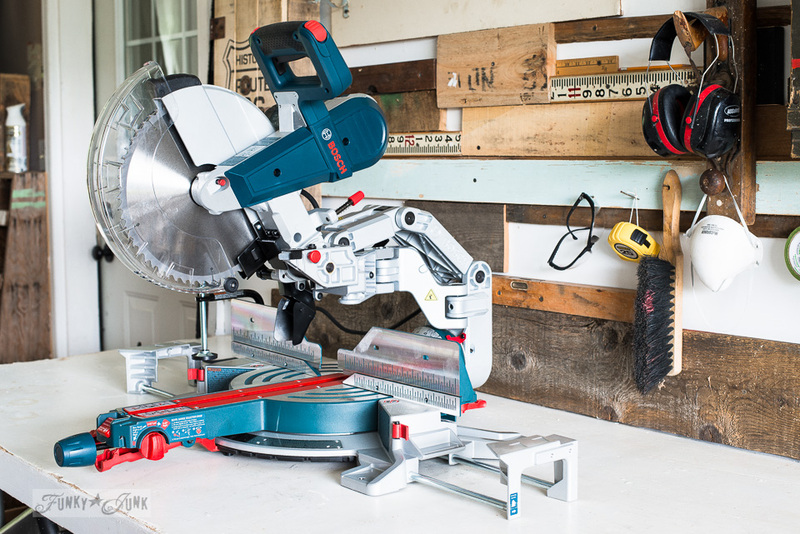 My workshop space is tight, and this saw fit on my table perfectly, thanks to the compact axial glide mechanism that resembles a robot arm. 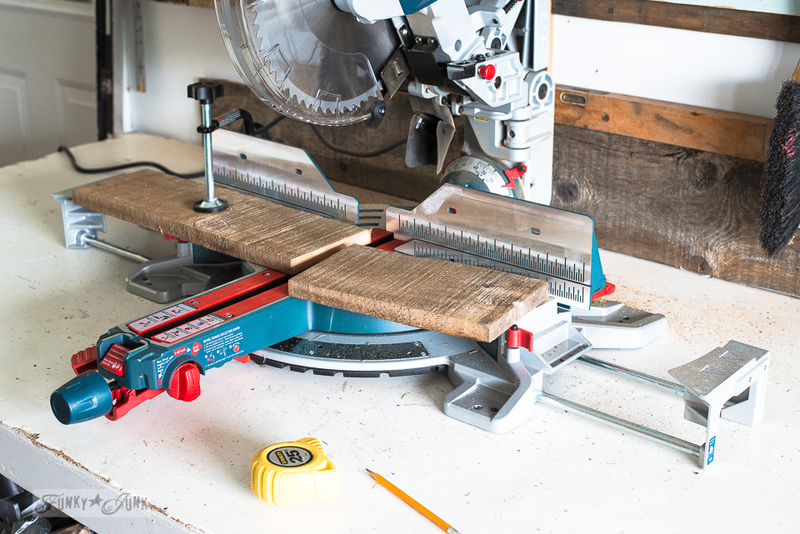 The saw can scoot right up to the wall, which is SUCH a space saving perk! 12″ blade – I didn’t want any limitations this round! Less space required due to Axial Glide Mechanism – it fit perfect! Glides sooooo super smooth! super important if you don’t have big, strong arms. Saw head spring isn’t so tight. Little effort required to pull down to cut. I liked that! It’s heavy, so best in a stationary location. I’m good with that. Doesn’t come with a laser, however I can apparently purchase one. 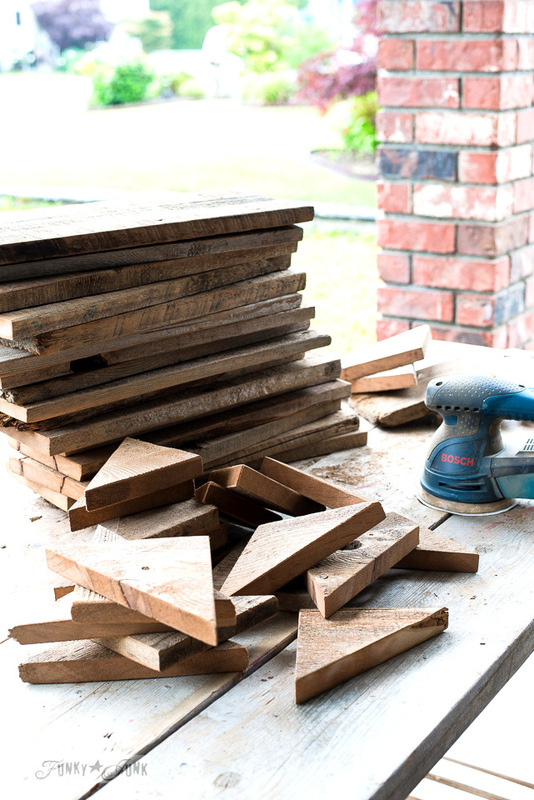 Once home, the first thing I did was screw the saw to the table top. Then I cut my first piece of wood. Whoosh… the soft whir of the blade met with a light puff of air like a mini blow dryer called it done. It was like cutting butter in comparison to my other clunky saw. I’ve also never ever had anything to clamp down the wood before so I was grateful for this fancy-to-me perk! And then I proceeded to cut and cut and cut until I had about 18 mini arrow sign blanks for the workshop I was about to teach. While I giggled the entire time. New, quality tools fascinate me. And here were the beautiful results! 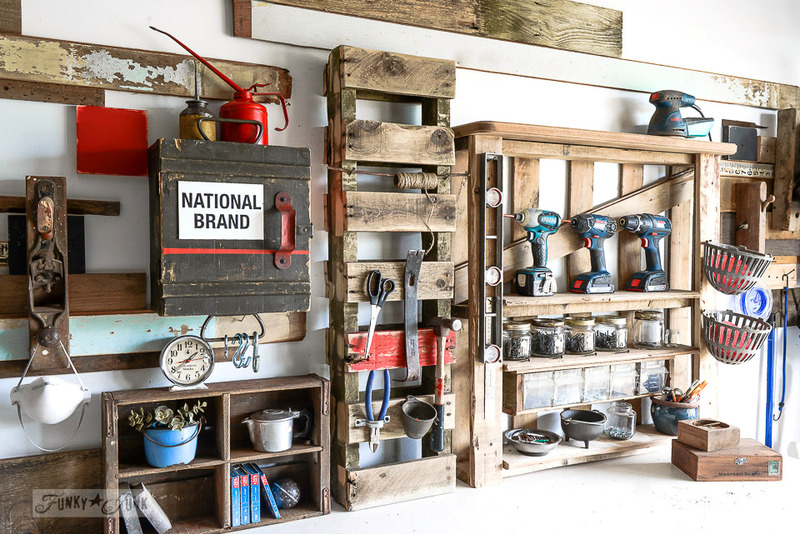 Everyone, meet a few wonderful Canadian Fusion Mineral Paint merchants! I brought ALL my Funky Junk’s Old Sign Stencils along to play with and guided everyone through some of my own authentically looking old sign steps. They chose their one desired word to make their sign uniquely theirs, then we played with Buffalo Check for the arrow tips, held to the sign blank with a rusty junk hinge. 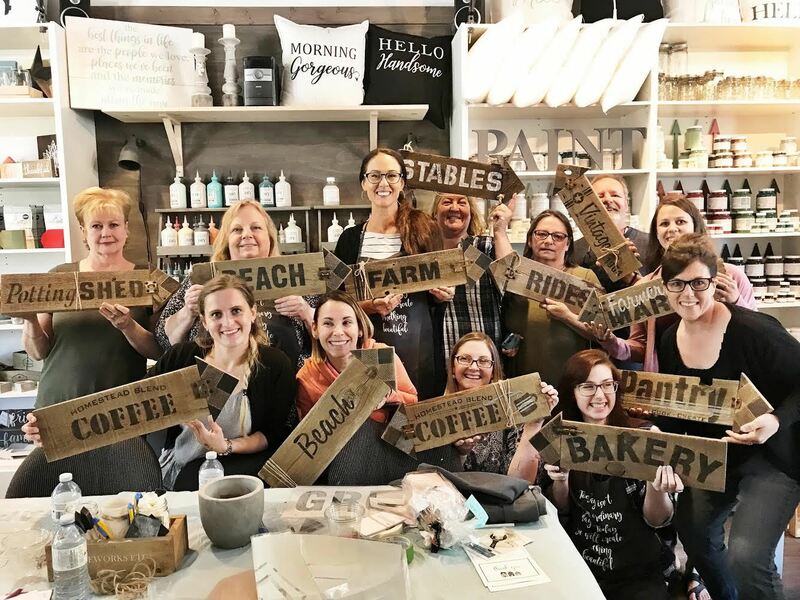 The event was hosted at Homeworks Etc, a lovely paint, home decor and workshop store run by Jaqueline, located in Cloverdale, British Columbia Canada. Such a beautiful shop, and this girl knows her stuff! I also led another workshop on how to create an effective business presence on social media to get the most bang for the least amount of buck. Now that I’m thinking about it, these two workshop topics would make terrific blog posts… now on the list! Here’s a mini video clip (click picture above) when I first brought this guy home! Anyway, miter saws are my #1 saw of choice in the whole wide world and I feel every home would do well by having one. You did good on your selection. Looks like the class had a great time. Love your new saw! I want to replace my old clunker with one with the slide arm too but have held off due to the cost. I have also experienced the kickback you talked about. It is scary when a piece of your saw breaks off and flies by you a high speed! The higher cost is no small deal. That too pushed me back with my delay so much, because you think, well, if I’m going to pay THAT much, I want the best! So hard to decide. Being able to play with the saw motions is the deal breaker. I highly suggest to play around at a tool store that is properly set up to allow this. I certainly can’t buy clothes just by looking at a rack! And neither should tool buying be like that. With my first cutting spree, I needed the slider, so there you have it. No more flipping boards and cutting twice! That’s worth the price right there. Just do it… you’ll be SO glad you did! WOW! A very nice saw. I will be looking forward to your new projects using it. Your class looks like they had a good time, know I would. Just wished I lived closer. It sure is a beauty, Nancy! And I’m looking SO forward to getting some long overdue projects done now that I have run out of excuses for not having the right tools. The class was so fun! Hanging around with other creatives is so incredibly inspiring. You can tell everyone LOVES what they do. That sure helps! As for living closer, one of my pipe dreams is to travel and host workshops. My life is changing to allow that now, so I see lots of new things on the horizon… maybe we can end up meeting after all! 🙂 What area do you live in? I’ve been using an older miter saw too and it is actually a loaner from a friend. I’ve been delighted to even have a miter saw available to me but I’ve only been feeling the need for one in the past year or two. There have been those times when I wished I had one with the slide arm. Like you, I try to research ahead of time before buying tools and it can all be so overwhelming to do so. I’m so glad you got the right input and you shared so that now if I decide to take the plunge to get my own miter saw I know what to go after. I hear you on all counts, Laurie. It’s a very overwhelmingly tough decision you don’t want to mess up on if spending those kinds of dollars. The key for me was being able to play with the saw motions. Please hunt down a store that offers this. I am a HUGE believer in picking up tools and fiddling with them to ensure they feel good in my hands before purchasing. I would personally never purchase something straight from a box or online alone, unless I already had played around with that exact model and knew for certain. This particular one offers such smooth glides, which makes it much more effortless to cut with, which is important for women. Highly recommend to at least check it out! Thanks for your further input. I’ve been happy with your past suggestions like my Makita drill set so I have no doubt I would be happy with your selection of the miter saw. On a similar topic, wasn’t it you that liked the short handle paint brush? 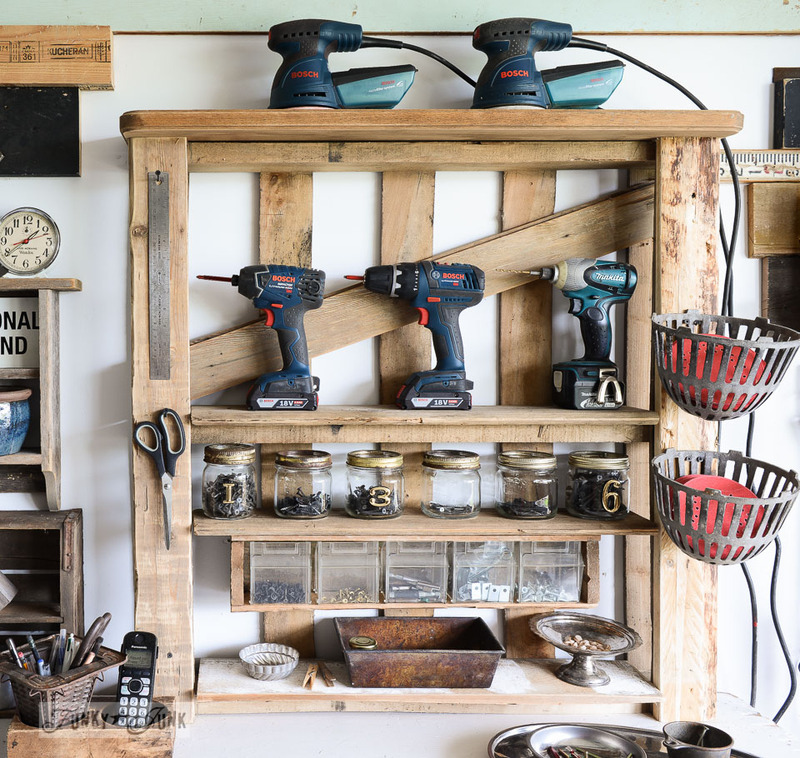 Have you ever seen a short handle hammer or stubby claw hammer? It is my go to hammer for a lot of my projects. I have a Pittsburgh simply because it was the first I one I happened upon. Now that I have one, I’ve learned there are others out there that might be better but the Pittsburgh has worked nicely for me. Nice saw, Donna. I have a smaller Bosch. Do you know why you got kickback? If not, you need to figure that out so it doesn’t happen again. Hi Julie, the branch was super irregular and if memory serves me correct, it was a little too short to hold onto tight. I believe it moved when the saw went down. I didn’t have any clamp on the old saw to help hold things in place. I won’t be doing that anytime again soon! Thanks for your timely reminder to NOT repeat! Oooooo, I think I may be suffering from a little tool envy right now. We also have a Bosch Miter saw but it’s a about 7 version earlier than this beauty. Love the fact that it’s got a slider extension for the bigger pieces. We have to use our table saw for those and that thing scares the living crabapples out of me. You know…. my husbands work shop is nothing short of ugly and dirty. I wonder if I took my stash of Old Sign Stencils out there, if I could enhance the beauty of it a’la Funky Junk?